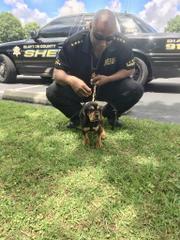 Sheriff Victor Hill’s New Blood Hound Named “Tracker” Training To Make History Hunting Bad Guys! Criminals beware! “Tracker” who will be first bloodhound in the history of Clayton County is training daily to become the best in the buisness at tracking criminals. Every day “Tracker” not only has to train on locking on to scents, and she even has to track her food! 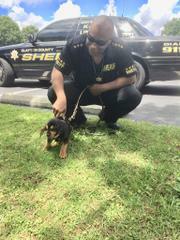 Tracker has grown in size considerably since she first met and was deputized by the Sheriff in the photos attached. The attached links of videos show how “Tracker’s” ability to hunt is growing as well. Bloodhounds are legendary for their tracking abilities. Often called a nose with a dog attached, the bloodhound is so adept at scent tracking its trailing results is admissible evidence in a court of law. Its outstanding ability to read terrain with its nose is primarily due to a large, ultrasensitive set of scent membranes that allows the dog to distinguish smells at least a thousand times better. Bloodhounds only need to be given the scent from piece of clothing or perhaps where the suspect sat. Once they lock into a scent it’s done. When a bloodhound sniffs a scent article (a piece of clothing or item touched only by the subject), air rushes through its nasal cavity and chemical vapors — or odors — lodge in the mucus and bombard the dog’s scent receptors. Chemical signals are then sent to the olfactory bulb, the part of the brain that analyzes smells, and an “odor image” is created. For the dog, this image is far more detailed than a photograph is for a human. Using the odor image as a reference, the bloodhound is able to locate a subject’s trail, which is made up of a chemical cocktail of scents including breath, sweat vapor, and skin rafts. Once the bloodhound identifies the trail, it will not divert its attention despite being assailed by a multitude of other odors. Only when the dog finds the source of the scent or reaches the end of the trail will it relent. So potent is the drive to track, bloodhounds have been known to stick to a trail for more than 130 miles. “Tracker” will not just track criminals for the Sheriff, she will also be on hand to help him find lost children, and missing elderly citizens who may have wandered off because of dementia. K-9 Cody who has already made a name for himself with 19 apprehensions will serve as Tracker’s bodyguard as she concentrates on using her specialized tracking skills. The Sheriff is hopeful that K-9 Tracker will complete her training in time for his annual “catch a robber for Christmas” initiative where the Sheriff’s Office teams up with the County Police to prey on robbers who prey on Christmas shoppers.